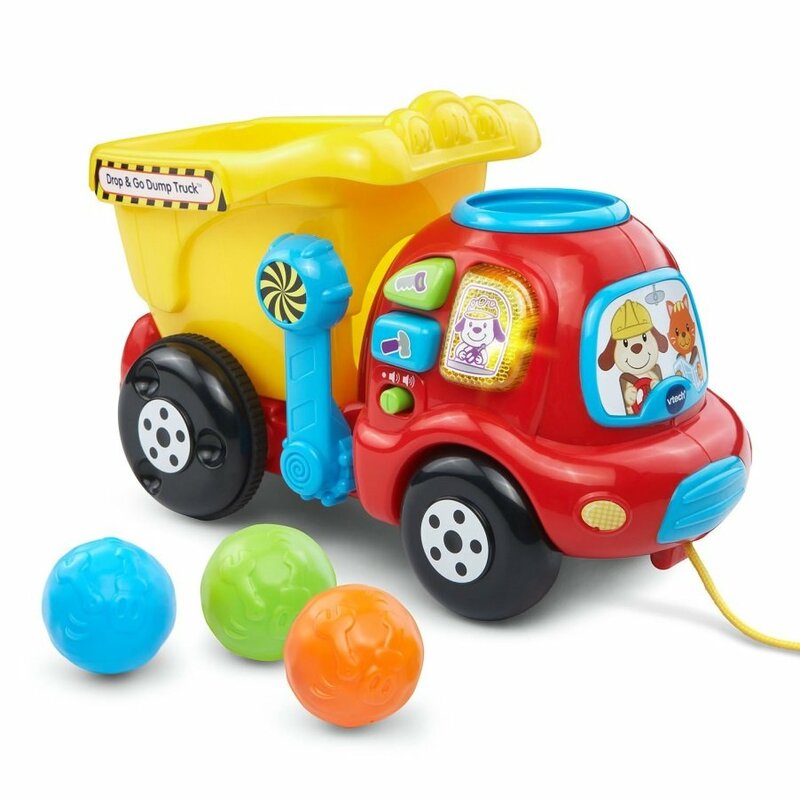 You are at:Home»Living»The Top 50 Best Toddler Toys This Year! Many say toddlers are easy to please, and in part, this is true. But sometimes you can be disappointed with either their reaction or the amount of time they play with the toys they received. So here I am to let you in on the hottest toddler toys of the year. 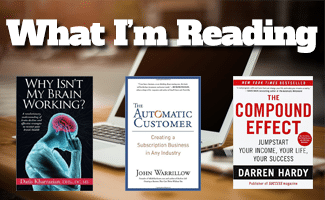 I offer a variety of prices and genres to give you many options without breaking the bank or if you decide to splurge, go right ahead. 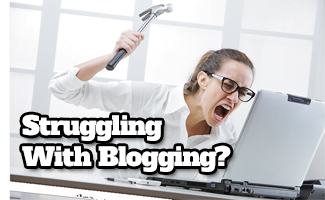 Get something specialized or generic. Either way, these are the toys that they won’t be able to put down. Don’t you want to make your little one smile? As you may acknowledge, little kids do not care about price and are often satisfied with the smallest of toys. 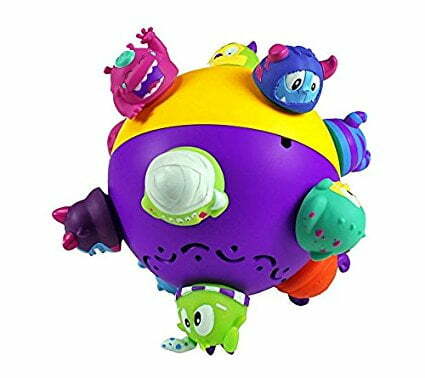 So here are a few solid options that will be a nice addition to your child’s collection, or be the focal point of all of their toys due the customer satisfaction! One of the best parts about these animals is that you can get two for less than ten dollars. Which means you can get one for less than five at the right stores. These adorable little guys can be found in a giraffe, elephant, lion, panda, rhino, cow, chicken, goat, monkey, tiger, and horse. This wide variety allows you ti pick your child’s favorite. Or hey, if you want, the whole collection is affordable! 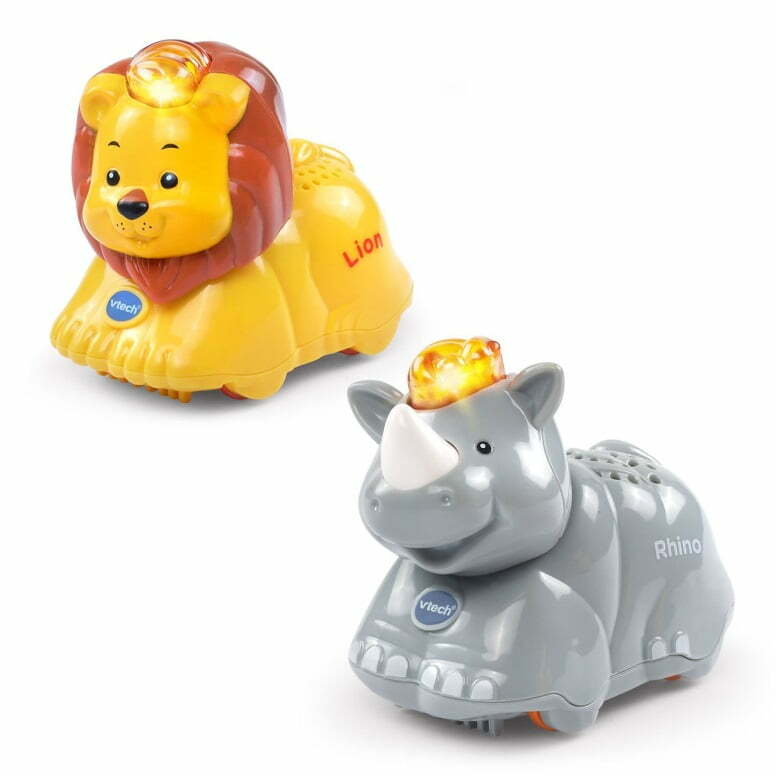 These little guys are durable and will keep you child busy for hours as they push around these wheeled animals and listen to their fun phrases, fun songs, as well as animal sounds. The names on the side are especially good for pre-school age children learning to spell. 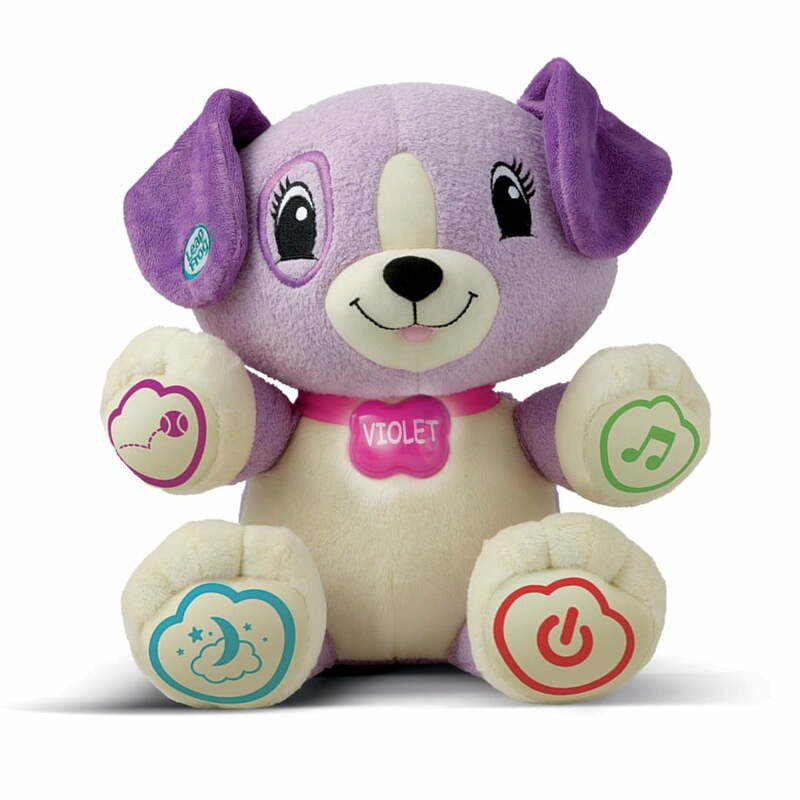 Kids from infantry to preschool will love VTech’s Smart Animals! These little bugs are the nanobot version of toys for the littlest ones. The Cuddebots will scurry about the room as you child chases after them, a good source of exercise as well as entertainment. If they catch up, don’t worry, these buggies are safe and have a squishy body. These Hexbugs let your child experience the fun of a nano bot without the choking hazard. When you get up close to your bug, you can even smell the honey lingering on the bee’s tail or the flowery goodness from your firefly. Get your Honey Bee or Lightning Bug today at a low price! 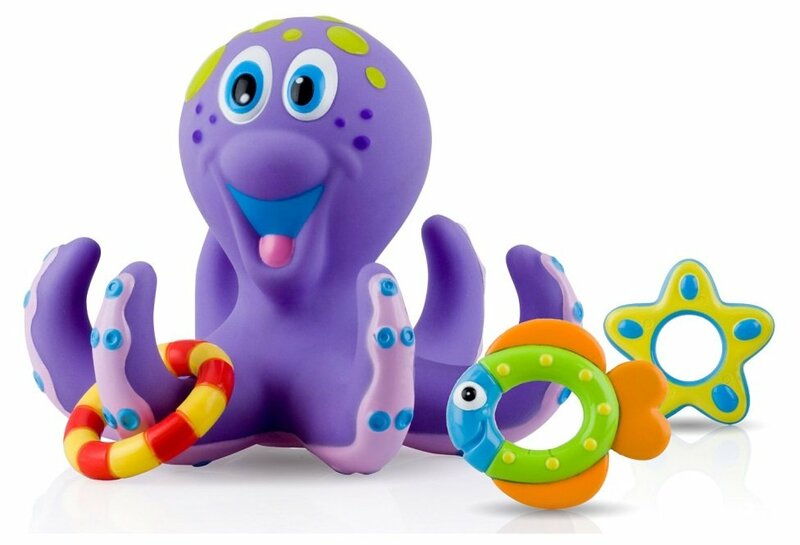 The Nuby Octopus is the perfect bath toy. He comes with three colorful, fun rings to play with and toss around his tentacles. A fish, star, and lifesaver! The purple guy is also BPA free, making it a great chew toy. Obviously, he floats in water and doesn’t have any holes, so he won’t retain water. He isn’t limited to only the bath though. He makes a great ring toss game, an addition to your animal kingdom, or a solo toy that can swim in the air or tackle a ship in a kraken-like way! This fun octopus is ready for a bath time adventure full of suds and giggles! This sturdy pounding bench is not only eye-catching, but also functional. Kids will love hammering down on these pegs and watching which ones will pop back up. This will help them train their brain by memorizing which peg triggers which. This particular bench is special due to the adorable faces of the pegs. It will build motor skills, eye-hand coordination and will help with both colors and numbers. 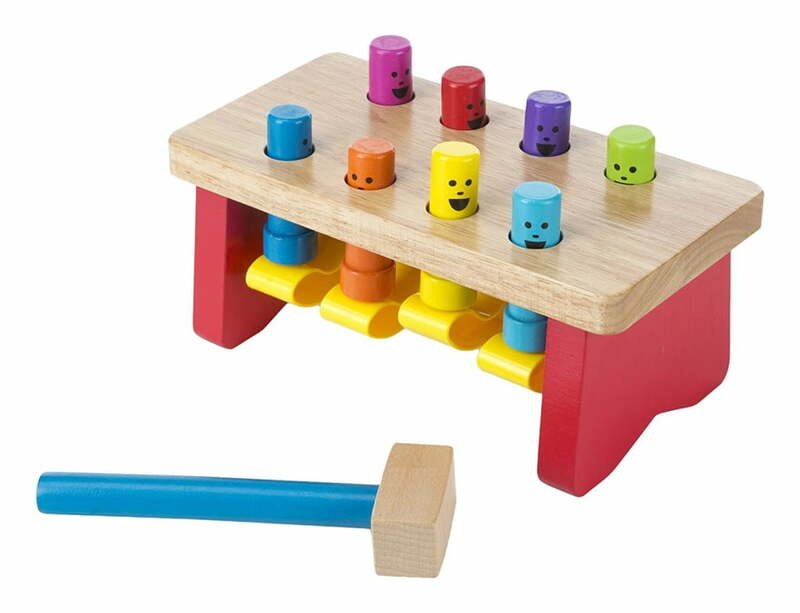 Plus, the little hammer will lead your child on the path to working with tools, a valuable asset many people lack. Whether it is cooking, construction, mechanics, or various things in day-to-day life, there is always a need for a utensil and this bench is a great place for little tinkerers to start. The simple truck is a great one for little kids who love interaction and vehicles. It doesn’t take long for them to figure out that if you drop the rock into the cab it will pop up into the bucket. After all three…as they count…one…two…three rocks are in the bucket, they can push the truck or pull it on a string and see the rocks tumbling around inside. 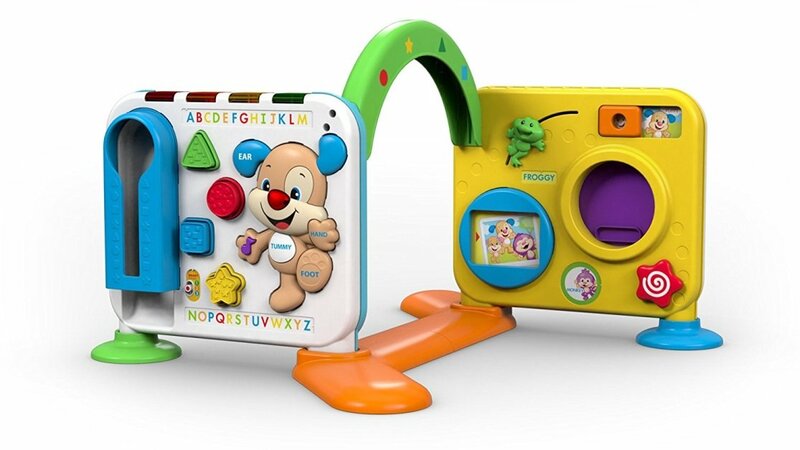 Three buttons will play music and teach your baby the names of tools and colors! After they finish, they can start over by fine tuning their motor skills as they dump the rocks using the lever attached to the bucket. The dog and car in the cab also adds an interesting living feature making this dumper unique! Fisher-Price building blocks in general never get old or fail to develop hand-eye coordination, cognitive skills, motor skills, and creativity in children. 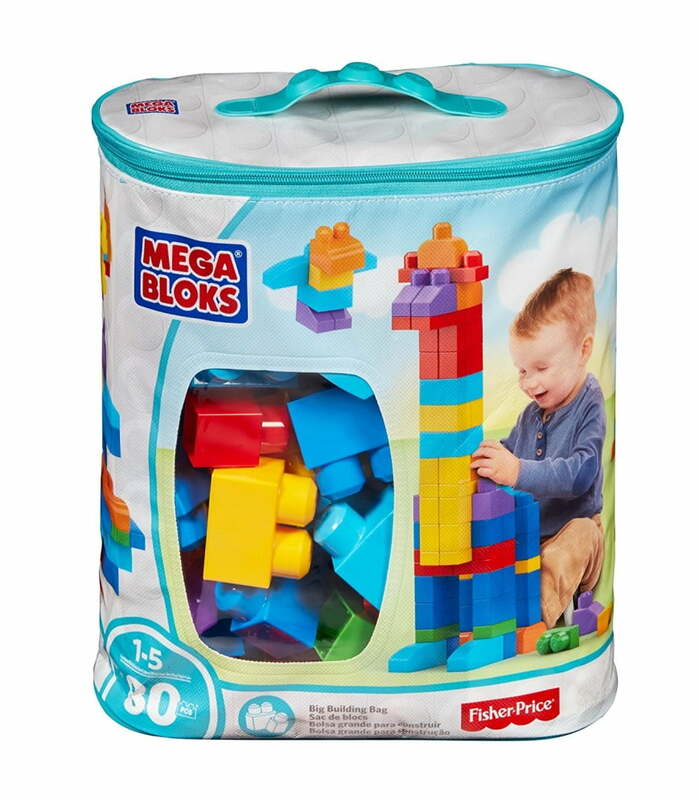 This set comes with eighty pieces for never-ending fun, plus a great, durable storage bag! The big pegs allow the tiniest hands to piece them together, and with so many colors and sizes, the possibilities are endless! 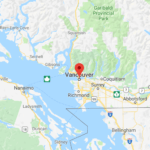 This is a great place to start for creative thinking, and to head your child in the right direction. 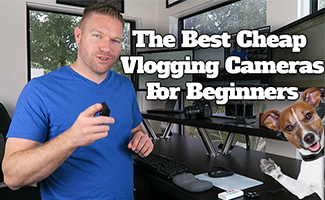 Even your older kids will enjoy helping the younger ones build limitless creations. 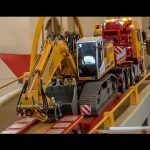 They are encouraged to build animals, buildings, vehicles, people, and more! 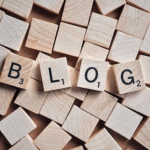 An added bonus: have you ever stepped on a lego? Well, these guys are a fraction of the hazard! These fun puzzle-like sets are great for children just learning to think on their own. The slates are easy to use and allow kids to create these simple designs, or even make new ones of their own. The plates include a dog, dish, and a pot of flowers, but really, it is strongly encouraged to create your own pictures using only your imagination. 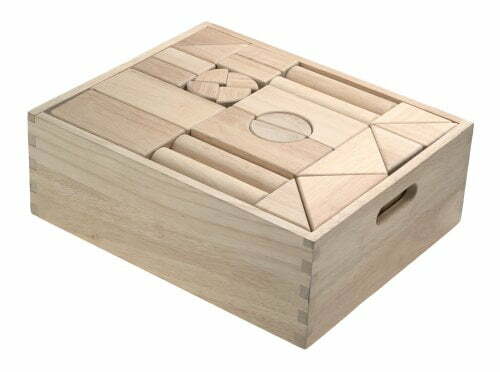 The sturdy board, box, and pieces make it suitable for small children. 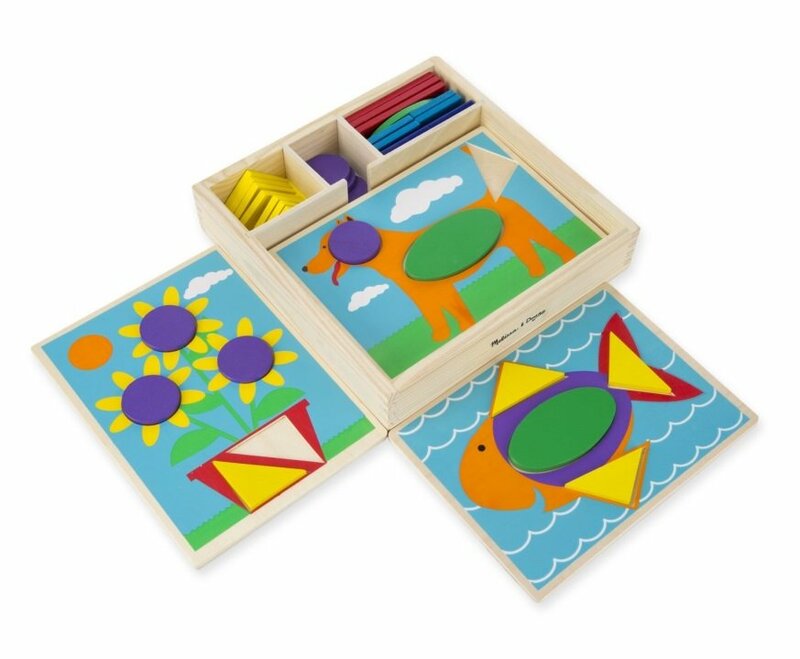 Not only will this set take care of the usual educational stuff, but it will naturally develop problem-solving skills, concentration, and good memory, with geometry as a bonus! The high-quality pieces are double-sided to prevent confusion. This is the ideal range for toddlers ages one to three. For this reason, there are quite a few more in this category. 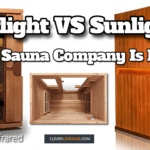 It is an affordable price while still retaining good quality. Any toddler will appreciate nearly any and all of these reasonable and fun choices. 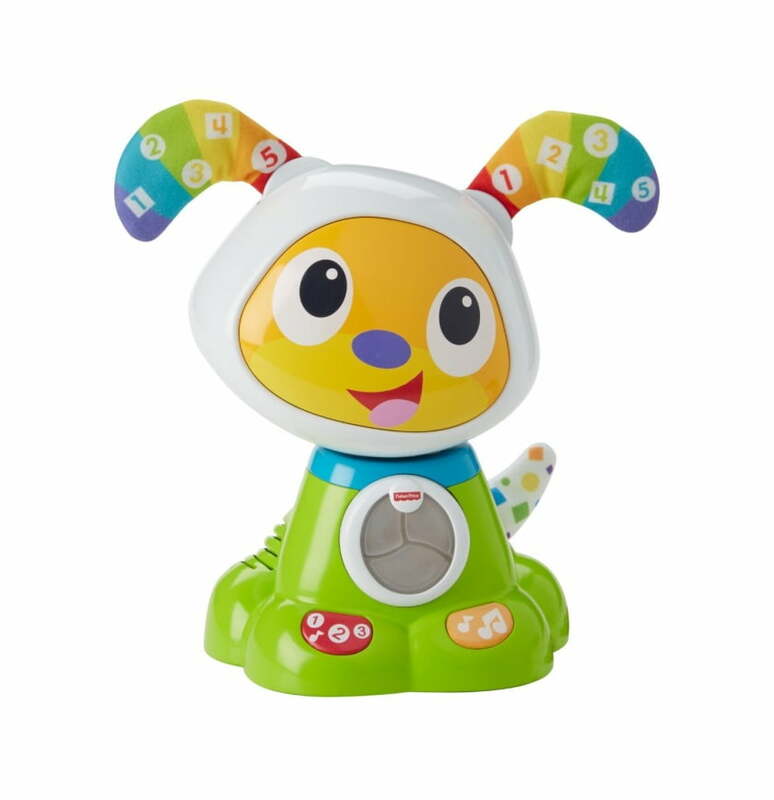 BeatBowWow the puppy who makes a great companion to BeatBo, is very happy and will keep you entertained as he bobs his head, wiggles his ears, and wags his tail! Ruff ruff and giggle with the adorable, interactive pup! Push his paws, his tummy will light up, and he’s ready with twenty-five different songs and phrases! He teaches babies numbers, patterns, colors, and more. He will encourage exercise and physical activity and you won’t be able to keep from dancing along! Kids are captivated by this cute little doggie and with good reason! These guys are selling like hotcakes, so go now! 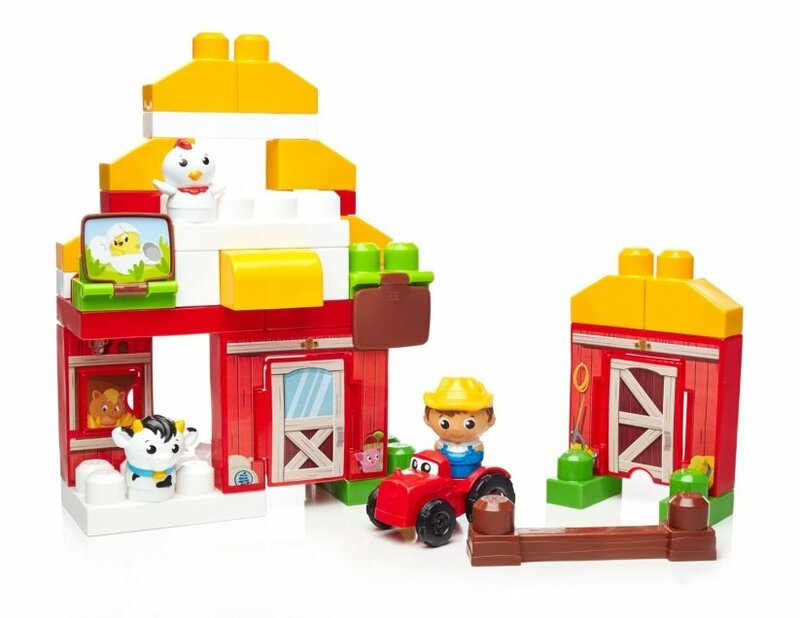 Mister Farmer loves to take care of his cows and chickens as he rides his tractor around the barn! The windows and doors on his big red barn really open, and his tractor rolls around on its wheels. This set combines building blocks and lifestyle playsets to develop occupational knowledge as well as creative thinking! Let your child grow by teaching them how to build their barn, harvest hay, feed their animals, and drive their tractor. This set tells a story that is often rare in today’s toys. The barn can even be built into a two foot building for additional fun! Flash the Corythosaurus, Crash the Tricertops, and others come in various sizes and prices. They will roar, growl and stomp aloud when you slam their feet on the ground as you cause them to walk like real dinosaurs with giant feet! Take yourself back to a time before electronics and concrete to one where dinosaurs roam. Kids will feel safe playing with these guys who normally seem rather scary for the younger ones. But not Thunder Stompers, they are just vicious enough to satisfy older kids while still being calm enough for babies! 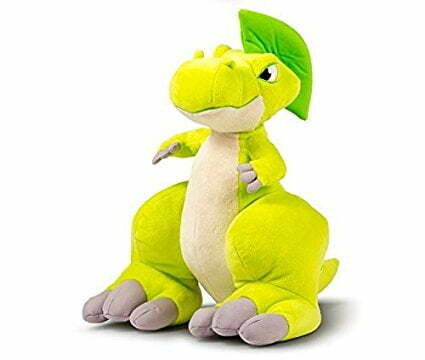 The high-quality plush is both long-lasting and cuddly, and as adults we think they’re incredibly adorable! Even the youngest of us dream to be a star one day! 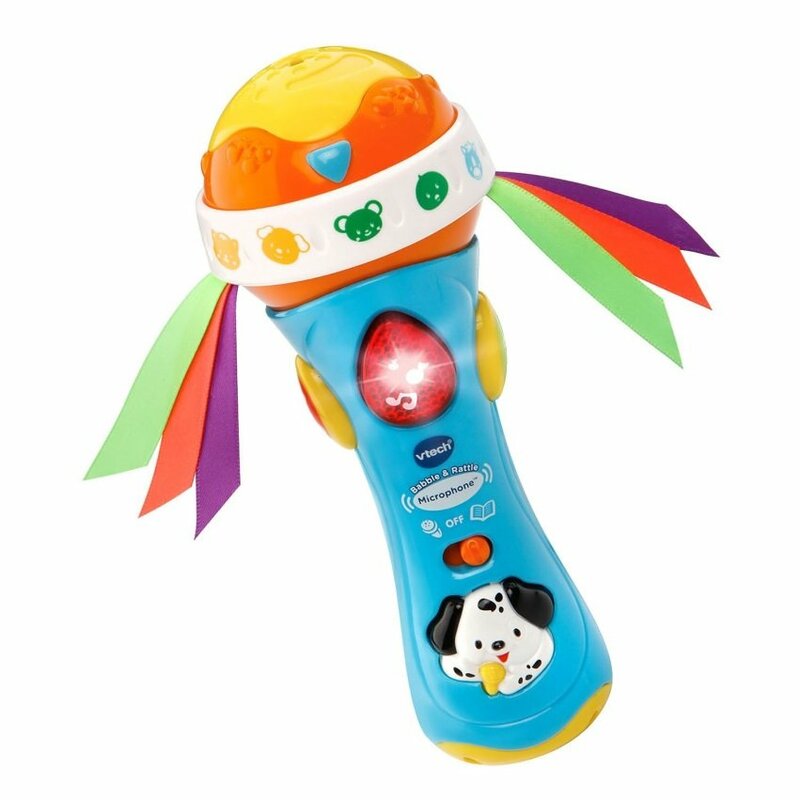 This mic can be used without batteries for a simple playtime that allows your kid to sing into the microphone in karaoke style. Or, turn it on and listen to over sixty songs, animals, phrases, and sounds! That’s a lot! The mic is also rattle that kids can shake and dance to. All around, this toy can spark creativity, develop motor skills, encourage exercise, and boosts confidence by freeing them from judgement and misconceptions! It is a must for children three months to three years, but children all the way to seven will enjoy it too! 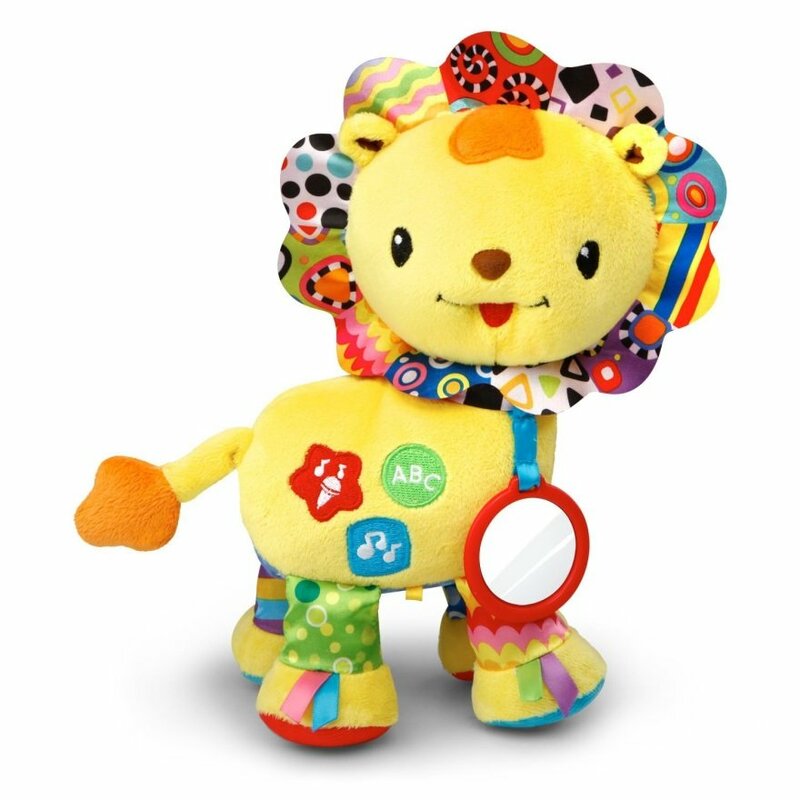 Crinkle and Roar Lion will teach your baby all kinds of shapes, numbers, and colors! He knows over fifty songs and phrases and roars like a baby lion! The lion is great for diaper bags and to attach to a stroller or crib with a handy built-in hook. In fact, he makes a wonderful crib toy or naptime pal. His crinkly mane, legs, and ribbons expose your baby to different textures. The mirror attached to his neck also creates elf-awareness as it allows babies to see themselves and control their faces. This soft and cute lion will please any child under two! From the official CAT Construction Company, comes this vroom vroom hard working operative. 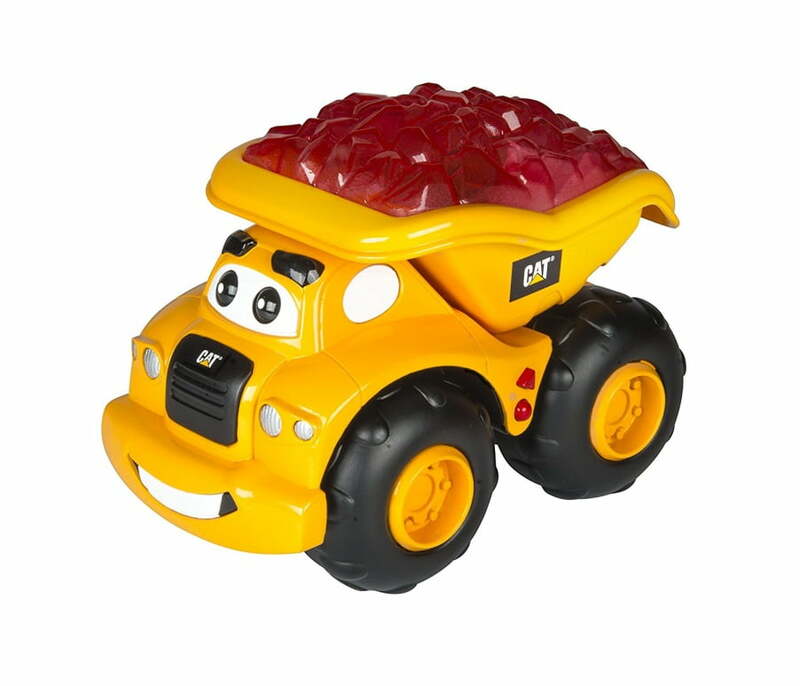 You’ll feel like a real construction worker as you work alongside one of our favorite dump trucks! Harry is ideal with his Bob the Builder style and personality. He is cheerful and friendly as he lights up, works with you, sings songs, and even drives on his own! For kids that enjoy tucks, he is a simple and fun option! This truck is unique as it is filled with built-in red “dirt” which kids will find interesting, yet it will keep your floors clean. I can dig that! 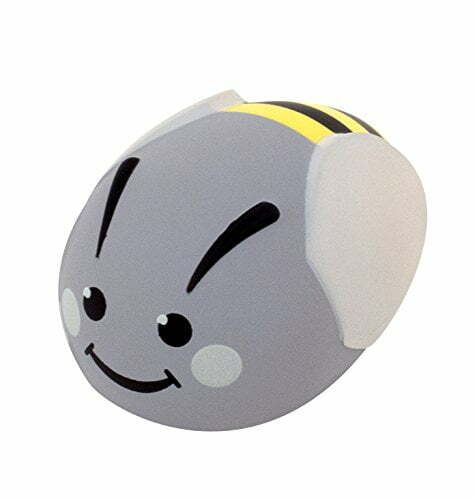 The Chuckle Ball is much like the old Bumble Balls for it rumbles and jiggles about the floor. When the monsters hit their head, they will laugh and giggle contagiously. If the ball is left unattended, it will go into sleep mode to wait for the next session. The cute and colorful little monsters will keep your little one moving and help develop gross motor skills. Each monster seems to have an individual personality and will make your child want to name them each and every one. Just remember to replace the batteries soon after you get it by twisting the two segments apart! “Who goes into the night? So they can save the day? Who are these heroes? 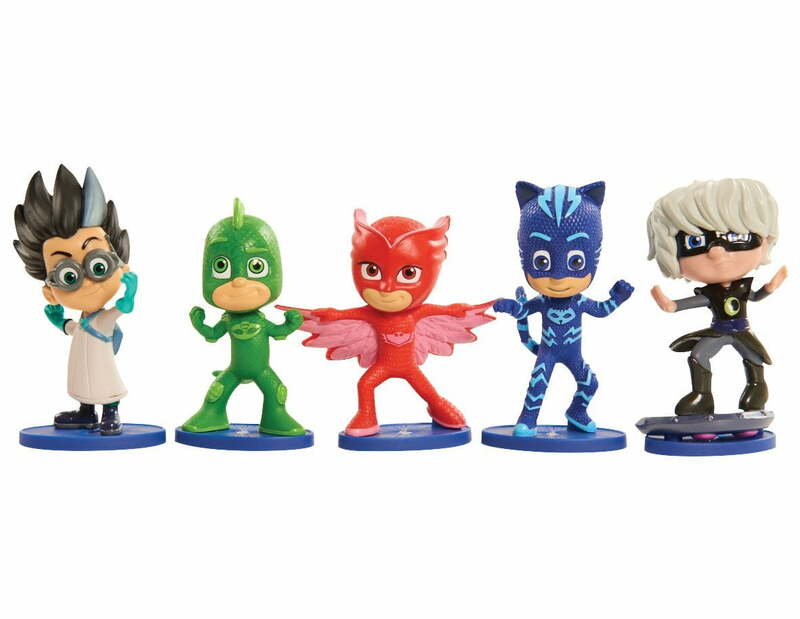 To show you the way?” The characters from PJ Masks are available at varying prices and figure sets. Fight crime and activate your magical amulets with all your favorite characters, such as, Owlette, CatBoy, Gekko, Luna & Romeo! Action figures are always a good choice, and these one piece guys make them great for younger kids too for they don’t come apart and are attached to their base. PJ Masks is one of the most popular shows of the year so there is so doubt that these pajama kids would be on the list! Scout and Violet are perfect little personalized pups. You can download your child’s name and favorite things to help Violet or Scout get to know them. The pal will teach your child his own name by saying it and evens spelling it! She can also learn your loved one’s favorite color, animal, and food! She has over forty songs available for your child to learn and sing along with. 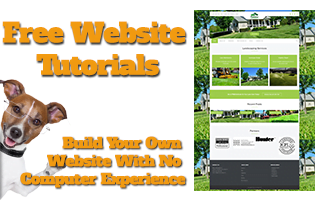 You’ll be amazed at the price of this guy who has so many customizable actives and feature. You can turn the volume up and extend the time for play or turn it down and cut the duration to fit nap time as your baby cuddles up with this comfy fellow. 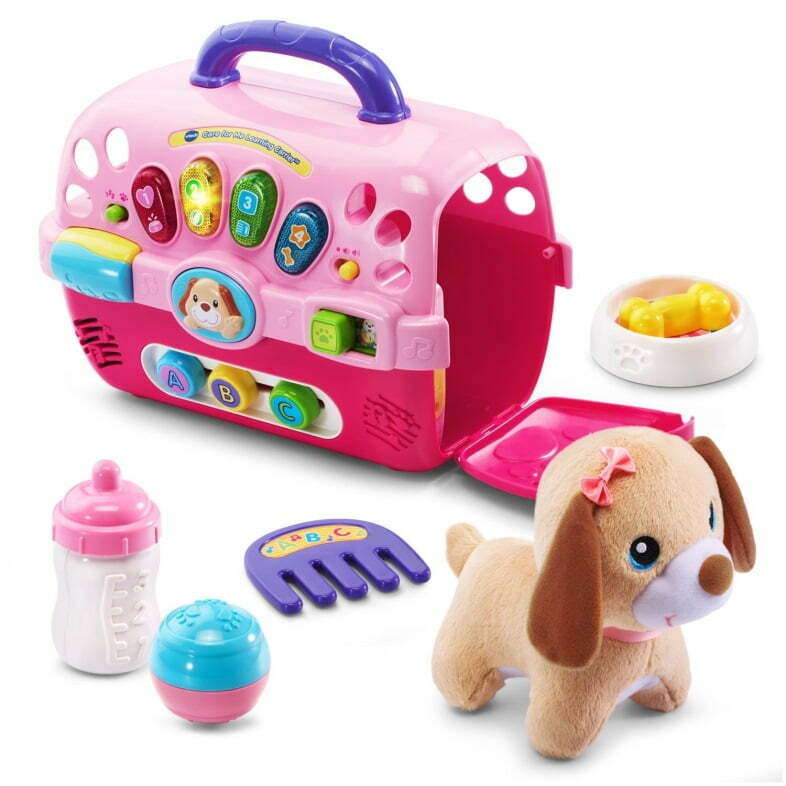 The Vtech carrier will teach your child how to care for a pet. They will feed the puppy, brush her fur, and play with her. The kennel makes it easy to transport your puppy anywhere you go. 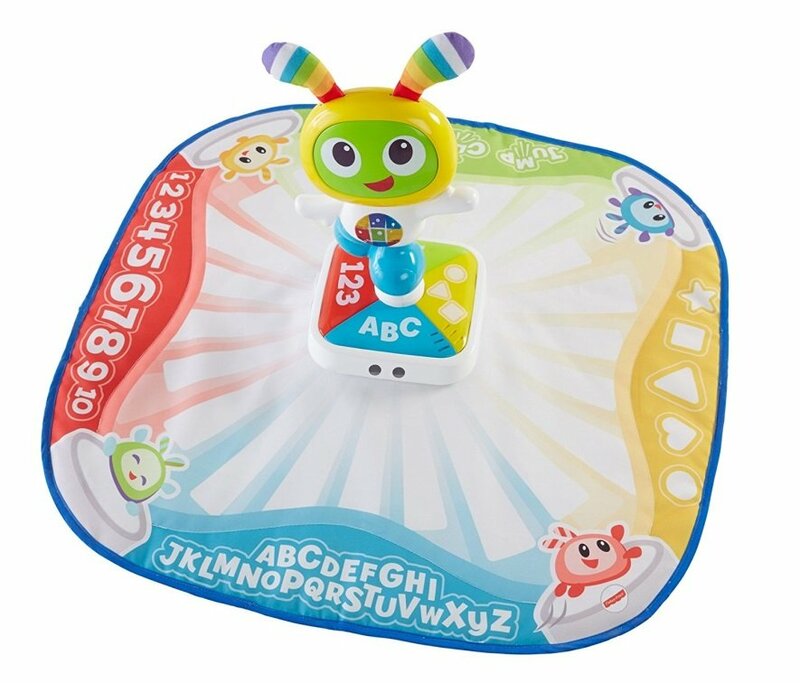 It also lights up and introduces opposites, shapes, letters, numbers, and colors to you child with over one hundred sounds! The pup is cozy too and great for a solo toy without the accessories, though she fits perfectly inside the kennel and her head can stick out in an adorable fashion! This toy is great for teaching responsibility, chore management, how to treat living creatures, and of course pet care! The classic learning walker has been updated with new frustration-free packaging! It is shipped in a plain brown box which is great for gifts and easy to open! The toy has five piano keys that will teach colors and numbers. 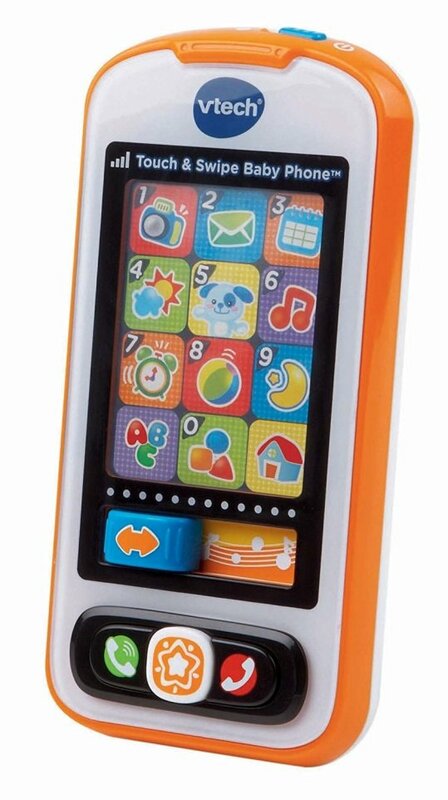 The phone will introduce your baby to socializing and fine tune motor skills and mechanics. As will the shape sorter, spinning wheels, and animal button! 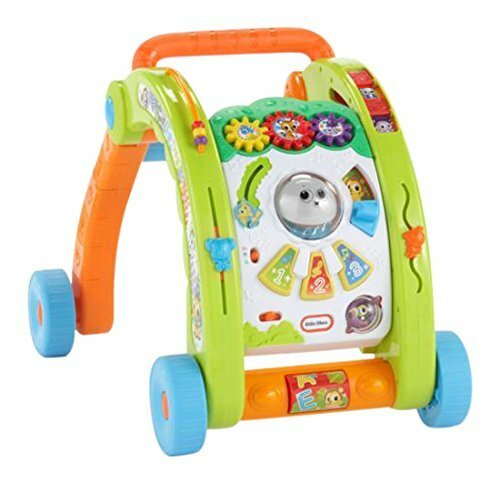 The colors and over seventy sounds are fun, but the main purpose of the walker is to do just that, help your child walk. It can lay down for babies who can only sit, and for young toddlers, it will sit up to promote good posture and give that extra assistance! 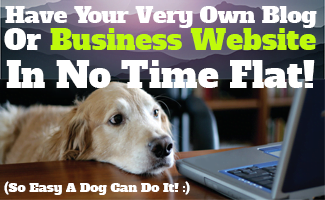 It works on carpet, hardwood, laminate, tile, and just about anything else you can think of. 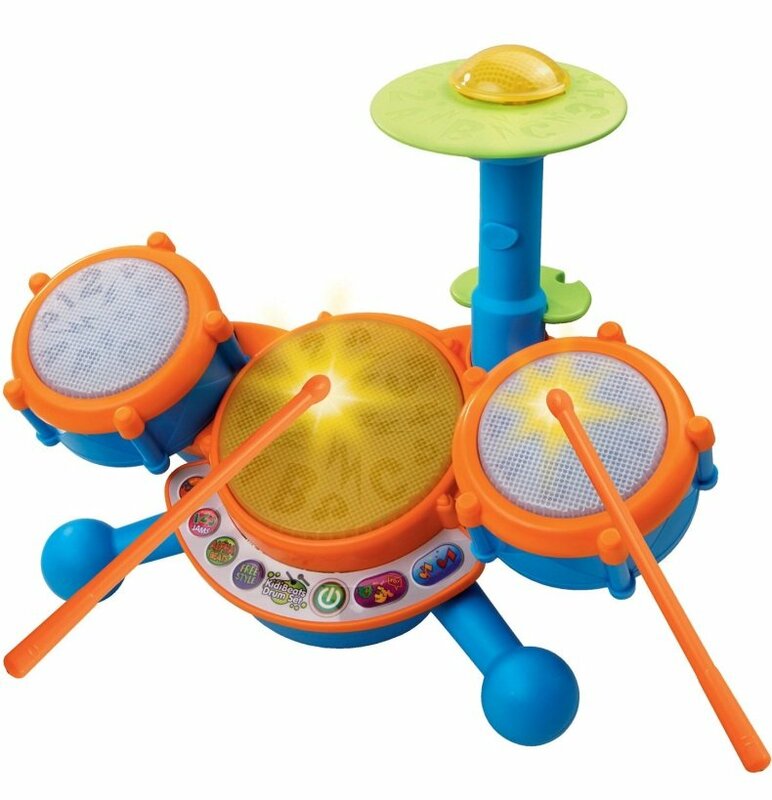 Vtech strikes again with this drum set for you future musician! But really, all kids love a drum set, even those not particularly musically inclined. Each drum and symbol makes a unique sound, which will teach your child prediction and help them connect. The toys are filled with numbers and letters, and the set plays nine different songs to reach various genres. This is a great educational toy to develop little minds. But let’s face it; kids love to bang on stuff and these will save your nice pots, pans, and younger children from bruises, bumps, nicks, and various injuries. Another valuable tool that all children should be exposed to is a flashlight. It’s important they understand the value at a very young age. 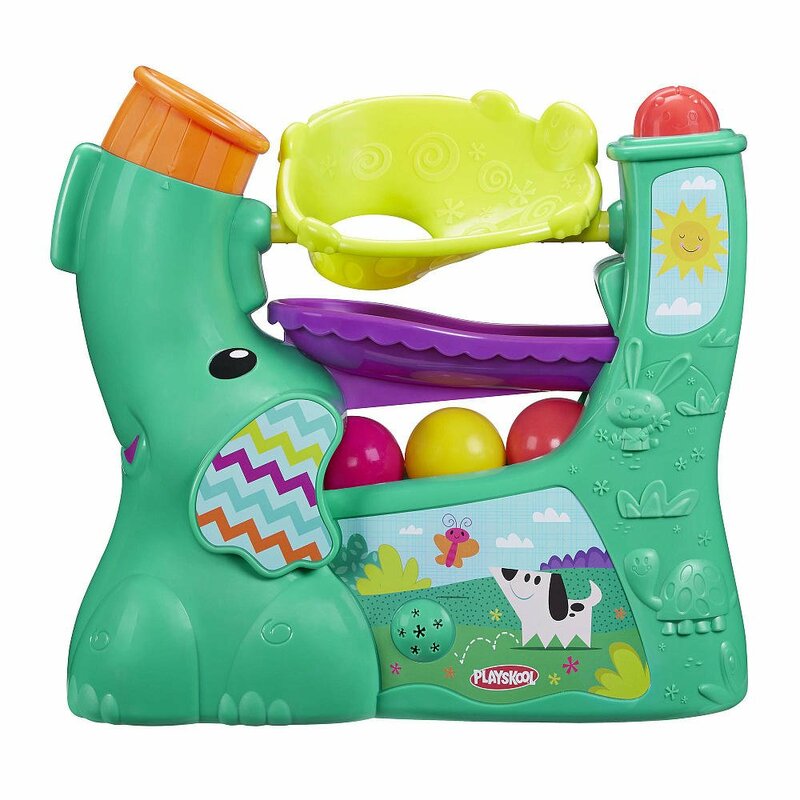 This toy also adds colors, numbers, and animals to their repertoire with fifty sounds! The volume controls will teach your child control and the lights will illuminate in a way that will not harm your child’s feeble eyes, but still help them comprehend lighting. The ladybug (or turtle) button is fun and interactive. Sounds include the standard songs, plus nature and animal noises. Until your child is responsible enough for a real flashlight, this is a wonderful alternative. This realistic set is a great introduction to cooking! It includes a colander, a pot with a lid, two pans, and two wooden utensils. You can teach your child the name of each piece and how to use them. If they decide to use real food in them, don’t worry, the set is dishwasher safe! 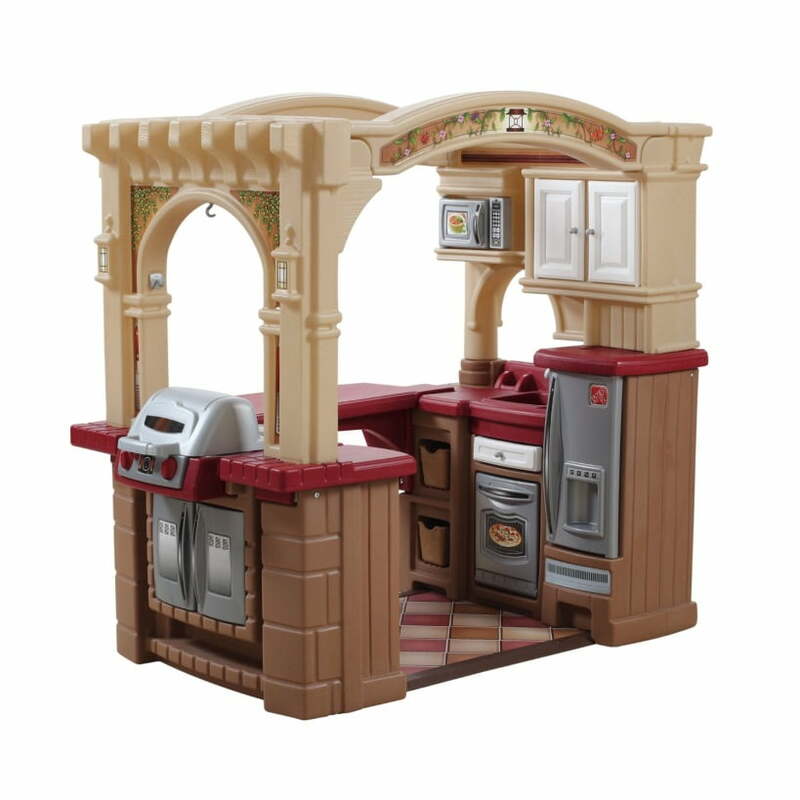 Kids will love pretending to cook with you or in their own play kitchen! It even comes with a rack for easy and attractive storage. Melissa and Doug know what they’re doing this this set whose quality and efficiency will be the envy of parents! These toys are the medium priced set. 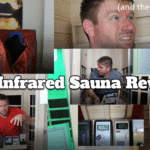 Not especially cheap, but affordable for almost any income. These are great for birthdays, Christmas, special occasions, or just because. Fiddle with kitty, rattle with puppy, and dance along with bear. These Vtech books are great for babies and young kids alike, even older kids will enjoy reading the book to the younger ones. 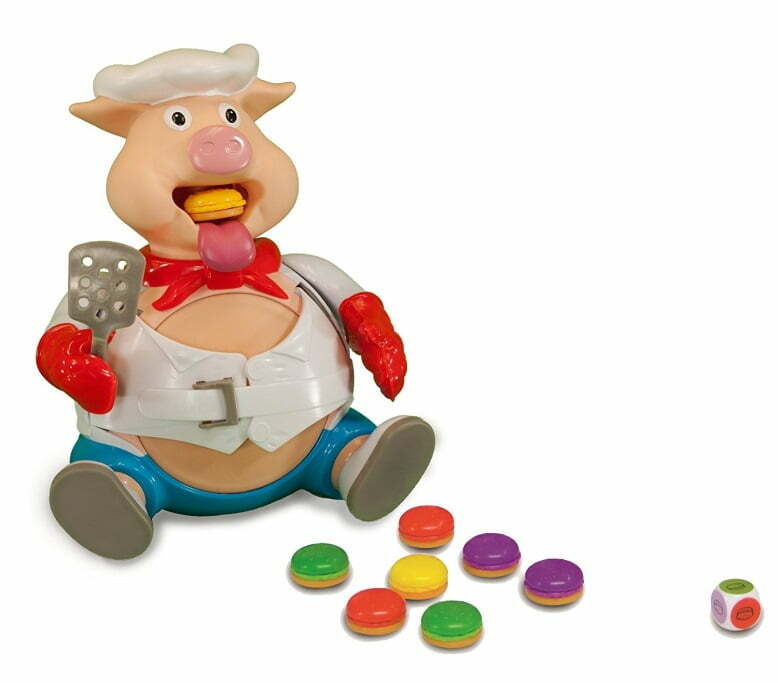 The buttons teach shapes, numbers, colors, animals, and musical instruments with over forty sounds. The book talks with the piano buttons that feature different instruments and sings nursery rhymes. The stories are interesting and the pictures are captivating for toddlers. For extra fun, the star lights up on beat to the music! 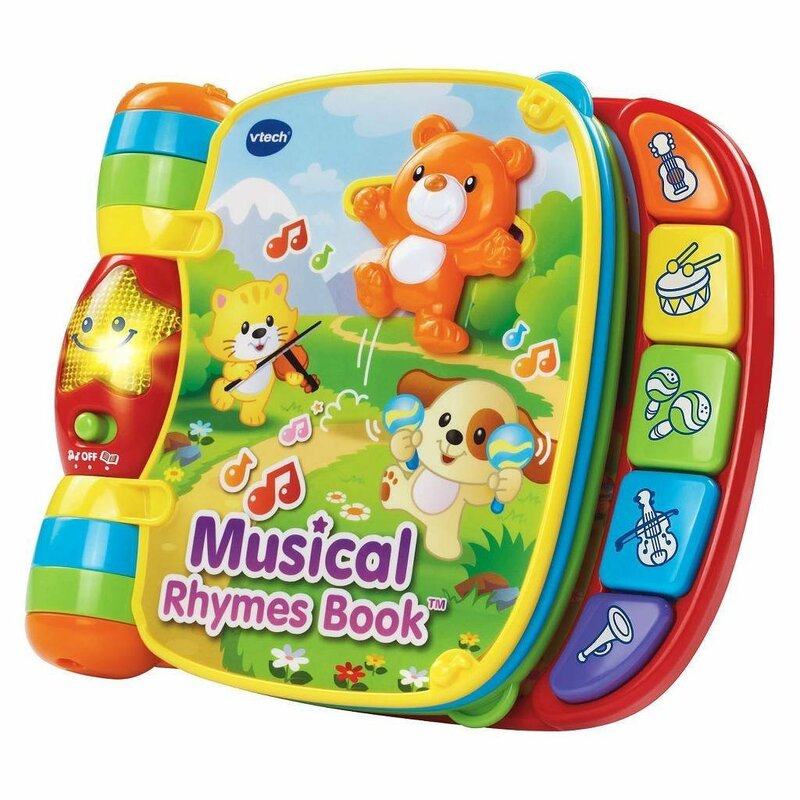 A musical book is a must have for children to develop many necessary skills! 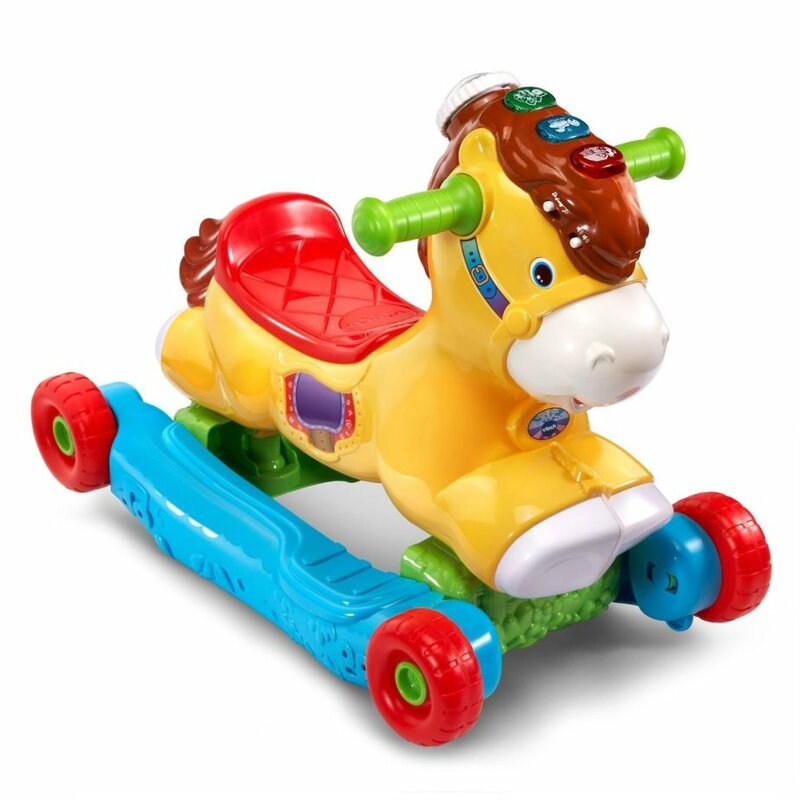 At the right retailer you can get this pony for relatively cheap, and he will give your child hours of fun. All kids like horses, it’s a fact. But they love to ride them! He can both rock for babies and roll for toddlers, widening the age your child will be entertained by him. 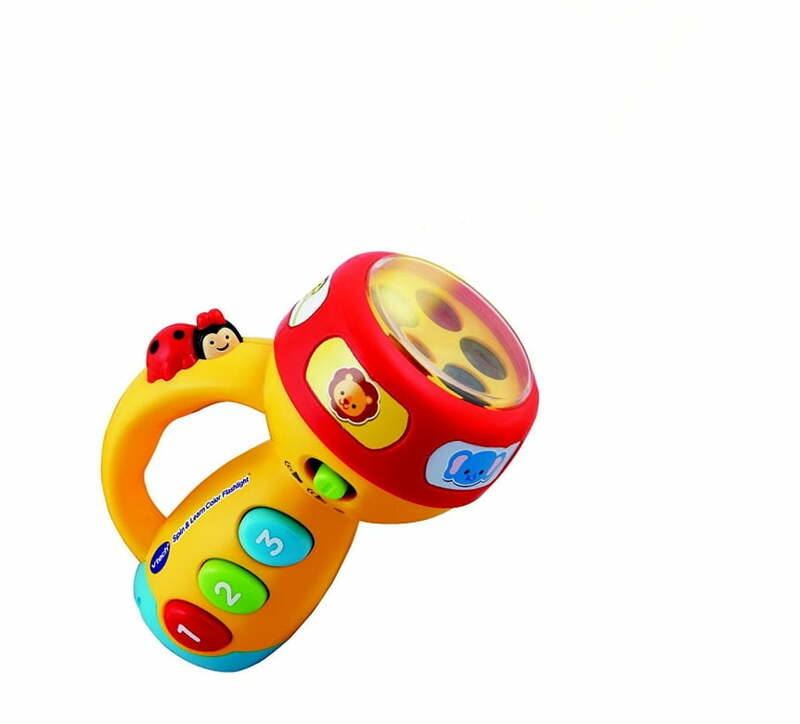 The light-up buttons introduce colors, animals, and over sixty various sounds. The motions sensors will prompt your child to keep moving with friendly reminders. This guy will whinny and neigh neigh realistically to help your child develop a relationship with the horse, giving him the encouragement to bond with pets. This mat is perfect for sitting and playing on in any way. But it is specifically made to dance on! The mat has four colored sections that teach something unique. The blue section teaches letters! The red section teaches numbers! The green section is for dance parties! The yellow is all about shapes! This interactive mat is hosted my BeatB, lights up and is full of action! Babies will love to crawl and wriggle around and older kids will simple wobble and dance their way over the mat as they use their minds find different songs and phrases! The cause and action is one to look into! Every little girl, and many boys, wants a majestic unicorn! Twinkle is a fantastic option! She can walk, wriggle, and flap her wings! She even interacts with the Go! Go! Smart Friends that can ride her to magical places! She uses lights, phrases, and colors! 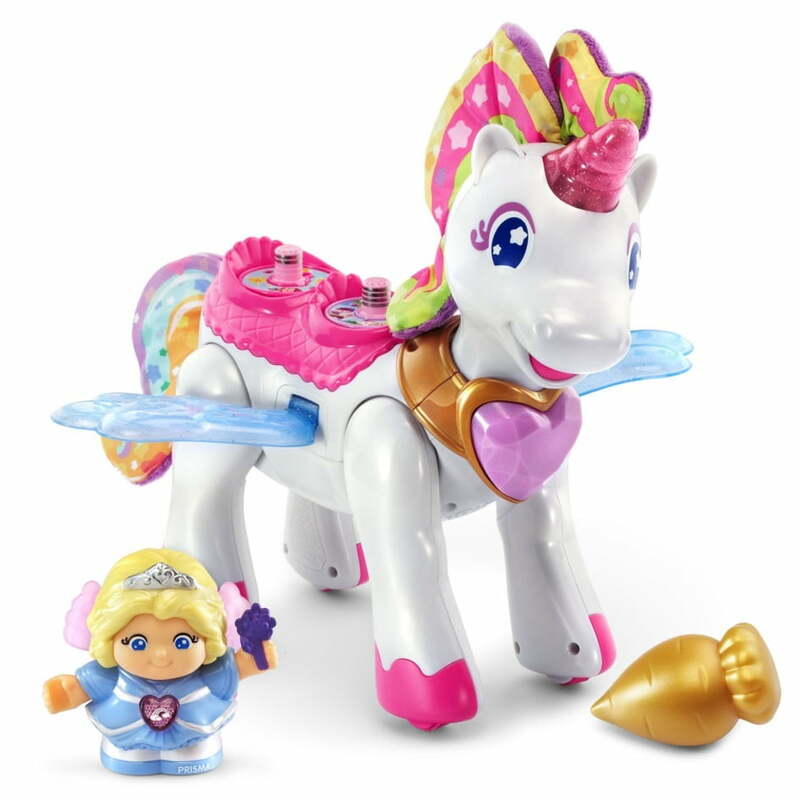 This unicorn includes a fairy princess named Prisma who also talks and interacts. When she rides Twinkle, she sings with glee. As a reward for the fantastical adventures, she can listen to Twinkle crunch down as she feeds her unicorn friend her favorite food…golden carrots! Everyone knows unicorns love those. This toy is fun for kids from one to seven! Like other Little Tikes walkers, this one leads you child from sitting, to standing, to walking. 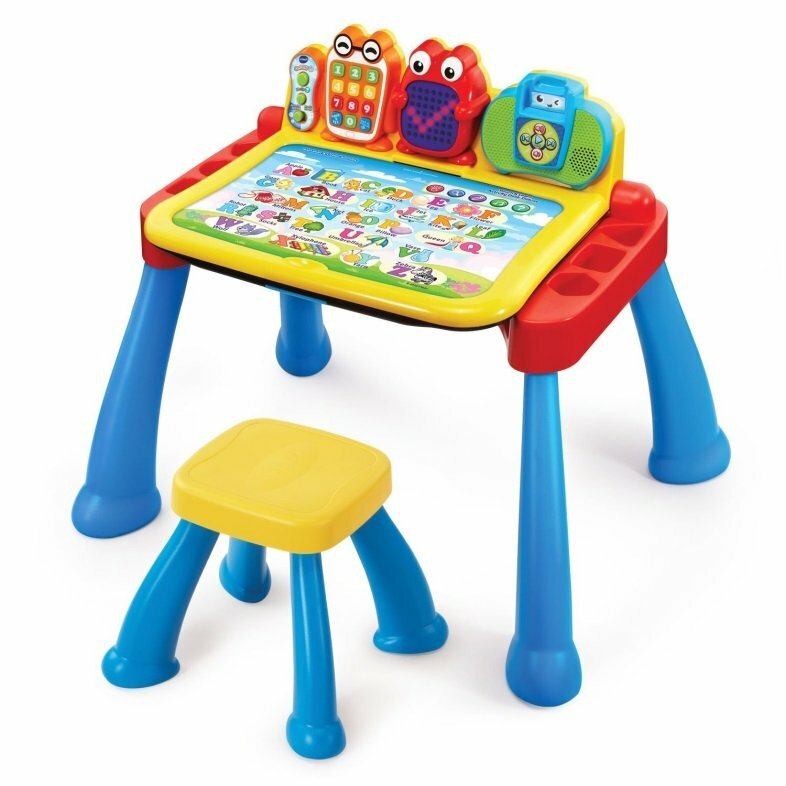 It has a play mode that lies on the floor, and rolling mode for kids learning to walk, and a table mode for older kids. The ergonomic arch makes it easier for toddlers of all ages to grasp and walk with. 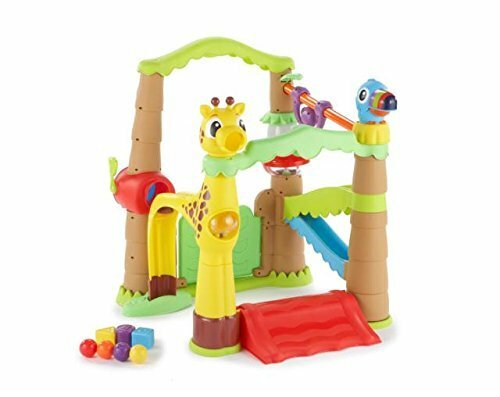 It is packed with the fun of a peek-a-boo lion, jungle drum, monkey slider, koala clicker, a spinning toucan, and an animal flipbook as well as numbers, colors, and letters. There are over seventy sounds to listen to, and fun lights to display. This Price is so popular that it requires its own category! With $50 you can buy a wonderful, high quality toy for your child! If you only get one gift for your child, make it a $50 one. 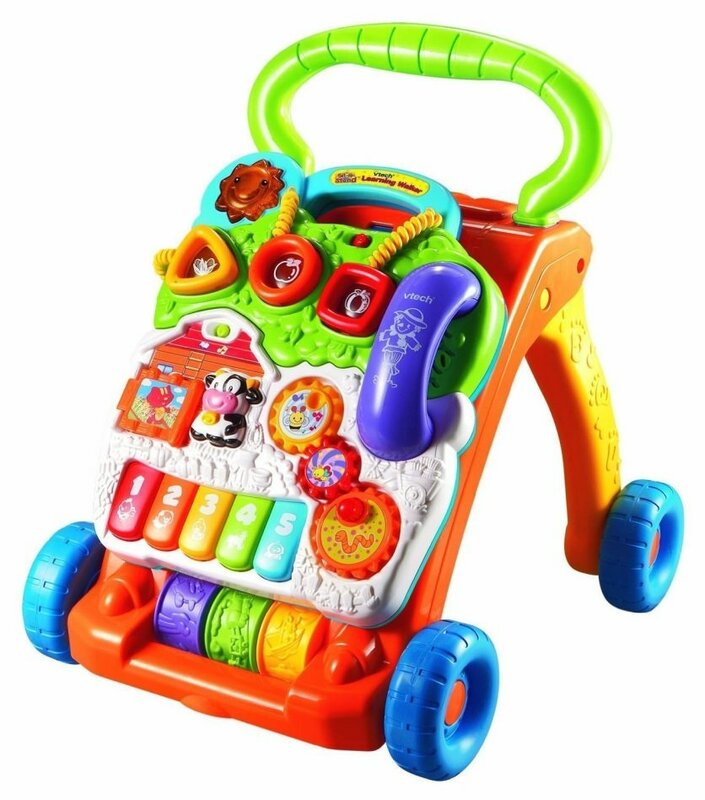 This is an advanced toddler toy where kids can connect the pieces of the caterpillar to go whichever direction they choose. To make things easier, each section of the code-a-pillar will light up as the action takes place. This will promote problem-solving, sequence, pattern, and memory skills. 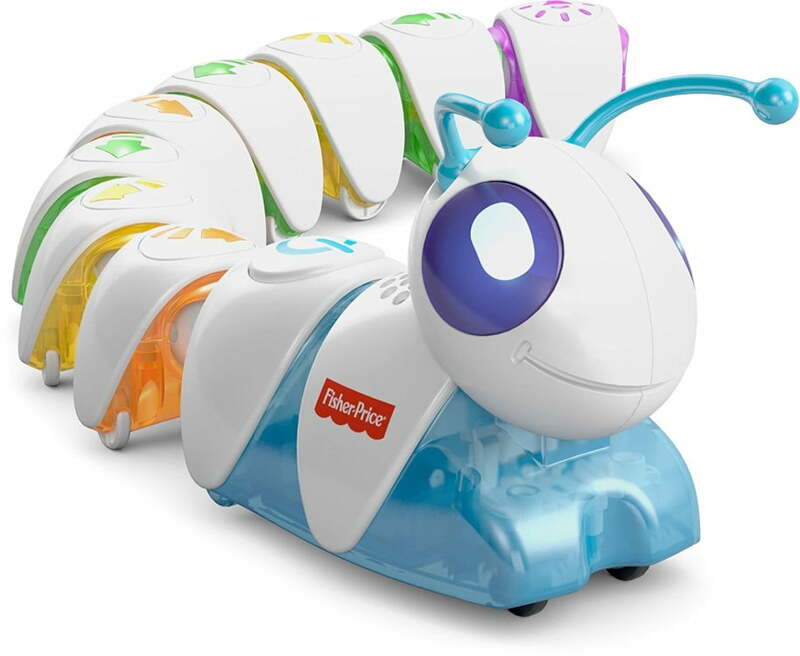 It comes with a start and finish to challenge you child to correctly program their Code-A-Pillar. Can you make it to the desired location by working you brain to form the perfect path? 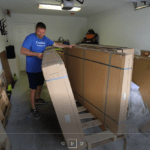 Perhaps intertwine your room and surroundings to build an obstacle course. If you run out of things to do, buy the expansion pack for endless fun and challenges. Let’s go out for a day at the mall! For Shopkins lovers, this is a must have! 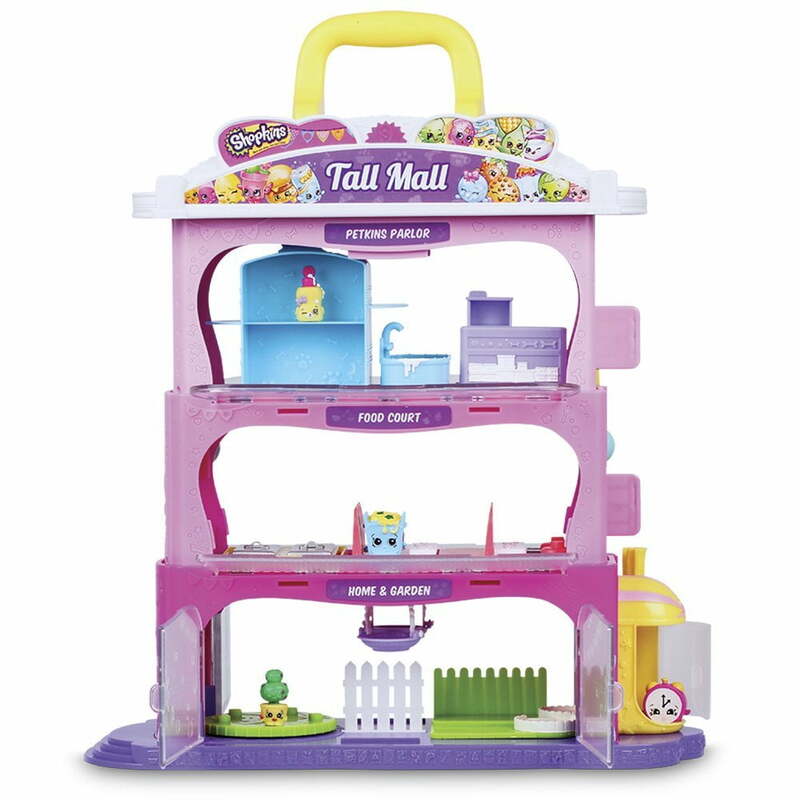 This mall works perfectly for your Shopkins. Start at Home and Garden, then make you way to the food court for a bite to eat, after that, pamper your pet in the parlor! You can use the elevator to access all of these floors. After you finish, you can fold it up for easy storage and mobility. If this is your first set, you need nothing more. The Tall Mall comes with four Shopkins. A tizzy clock, puppy soap, a girly shrub, and a blue bin! This fluffy pup is one of the cutest of the year. Any child would love to adopt Snuggles (who is open to a name change) She is bright-eyes and as cuddly as they come. She breathes and moves like a newborn puppy, enhancing her connection to the world. You can pet her, feed her, and put her to sleep. She will bark, snore, and burp in reaction to you. Included are adoption papers where you can sign your name and even rename if you wish. This is a great “first pet” for your child that teaches responsibility and pet care. Trolls are where it’s at this year. Every kid who’s seen the movie will want one. 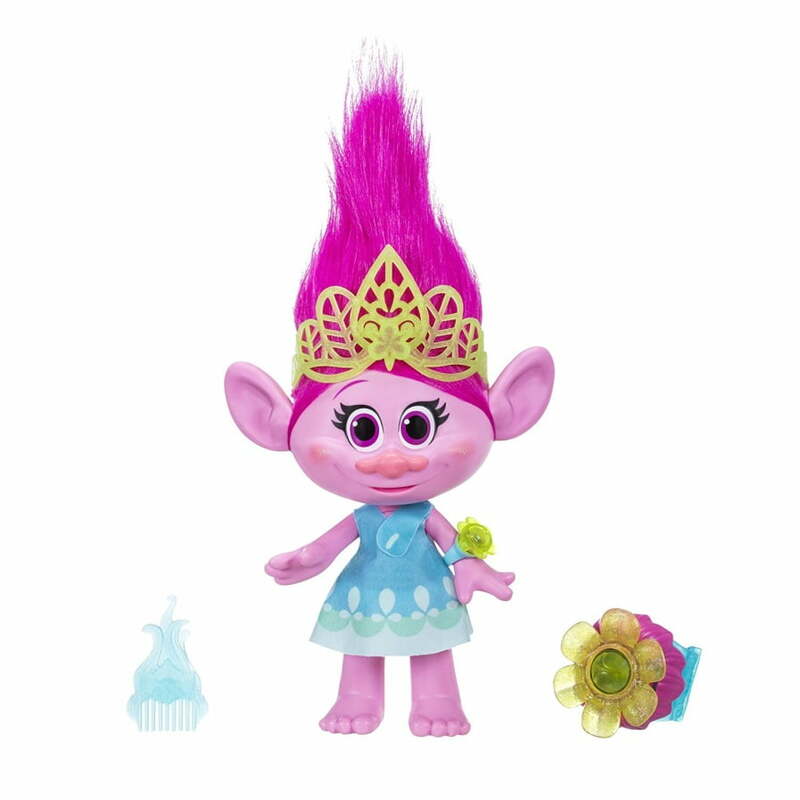 Although there are many characters, Poppy, who has her very own personality that is displayed in this toy, is especially popular as she will sing songs and recite quotes totally twenty-five. She comes with a brush to use on her light-up hair. You can interact with her by using tour matching bracelets! She is much bigger than she looks at fifteen inches tall, the perfect size for a prompted hug. She can move her arms and legs and twist her head for a more realistic feel. This crawling baby is one of the hottest dolls of the year. You can get a bye bye baby in blonde, brunette or African-American, allowing personalization. She crawls all alone, or plays with you by laughing when you tickle her, rattle her rattle, or talk to her. If you feed her, you will need to change her wet diaper. Don’t forget to brush her hair either. When it’s time to go, pack her up in her carrier and wear it on your shoulders. Dolls are a valuable toy for both girls and boys as they learn to care for and nurture a baby. She can speak both English and Spanish opening up the communication for many kids. This crawl around center is like a mini-playplace for your living room. There are four panels with many activities. Get this…there are two-hundred sounds packed into this thing! There are three difficulty levels allowing babies and older kids alike to enjoy the center. There are games using blocks, and the puppy will teach your baby body parts and shapes. You can record messages with one panel to leave your child, and a frame for a photo on another, adding individually and a feeling of comfort for you baby when they are alone. This piece wouldn’t be complete without various rattles, buttons, spinners, sliders, clickers, a dial pad, a window, and more! Melissa and Doug always know what’s going on and their blocks are timeless. These classic sets will keep kids of all ages entertained, including toddlers. This set includes sixty pieces that come in many different shapes. Half circles, round pillars, square pillars, ramps, triangles, and more! The possibilities are truly endless. The blocks are high quality, durable, and long-lasting. They come with a beautifully crafted box to store them in. It’s amazing how simple pieces of wood can entertain us. It is believed we were made to become inspired and create worlds of our own. This set comes without instructions to promote creativity and imagination! Here’s where the toys are considered “big gifts.” They are reserved for but not limited to impressing a child or showing your love toward them. 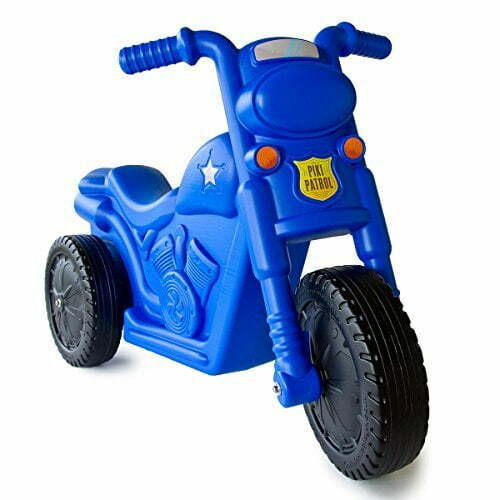 “Piki Piki” is the Swahili word for motorcycle so that makes the name for this toy absolutely perfect! This bike come constructed and is lightweight for easy transportation. It steers just like a regular bike, helping the child develop coordination and learn to ride the real thing. It is safe for one year olds through five year olds, and this will eventually lead to the ability to ride a bike as it builds skills and confidence. Kids of all ages like bikes and this one will allow the little kids to ride with the big ones. It comes in red, blue, and pink. Since he’s been around for over fifty years and he’s still choo-chooing, Thomas the Tank Engine will never get old. Neither will ride-on toys. So you can see why this Thomas Ride-On is so popular. His face looks just like the new cartoons, and his color is nearly trademark! 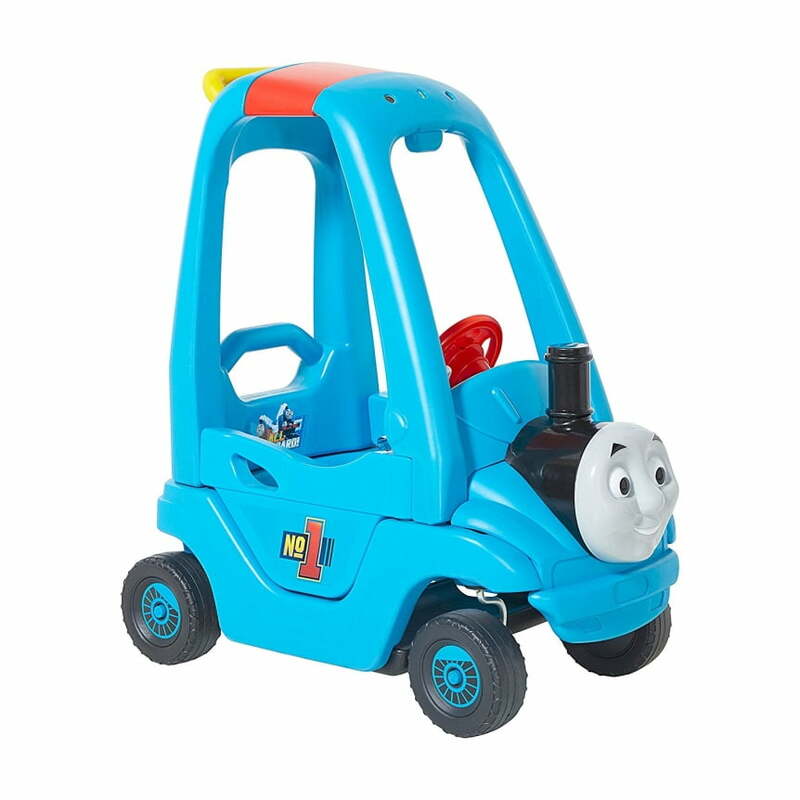 Thomas’ doors open and close for easy access, and he has a steering wheel that lights-up and makes sound. Kids can use their feet to propel themselves forward. One thing that makes this guy unique is the handlebar that makes it easier on parents who have to lug this thing around. This “jungle” gym is full of fun lights and animals that babies and toddlers will love. Everyone wants treehouse and even the smallest of us deserve one. So here we are to give it to them. There are three fun modes: the dance party, firefly collector, and color explorer. Babies can crawl through the archway or load the mailbox; play with the balls, the ticking clock, and swinging doors. They will have a blast feeding the toucan and giraffe too! When your baby grows, the gym can too as you fold it out to expand it, this will last your child years! 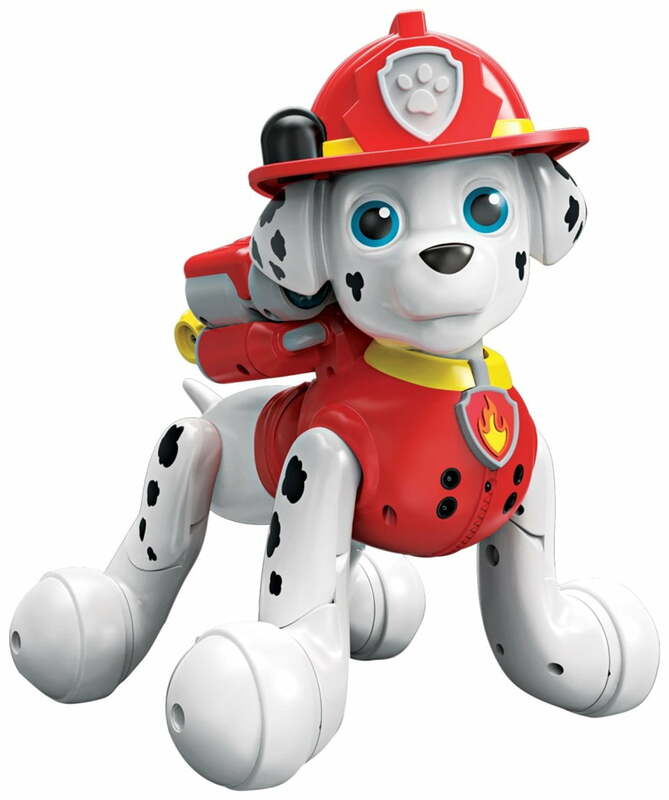 “Ready for a ruff ruff rescue!” We’re fired up for this Marshall who is just like the real thing. He can run like the fire marshal on Paw Patrol and says over one-hundred and fifty different phrases. He also has over eighty tricks and missions that you can interact with. Whether you need to save Chickeletta or put out a raging fire with his water cannons, Marshall is up for any rescue mission! Surely you are too! He is surprisingly durable and kids from one to ten will enjoy going on all kinds of adventures with him! Paw patrol is on patrol! Everyone loves tents, and this option is great for kids from one to as old as you can fit inside! With little kids, you can fit at least three friends inside! 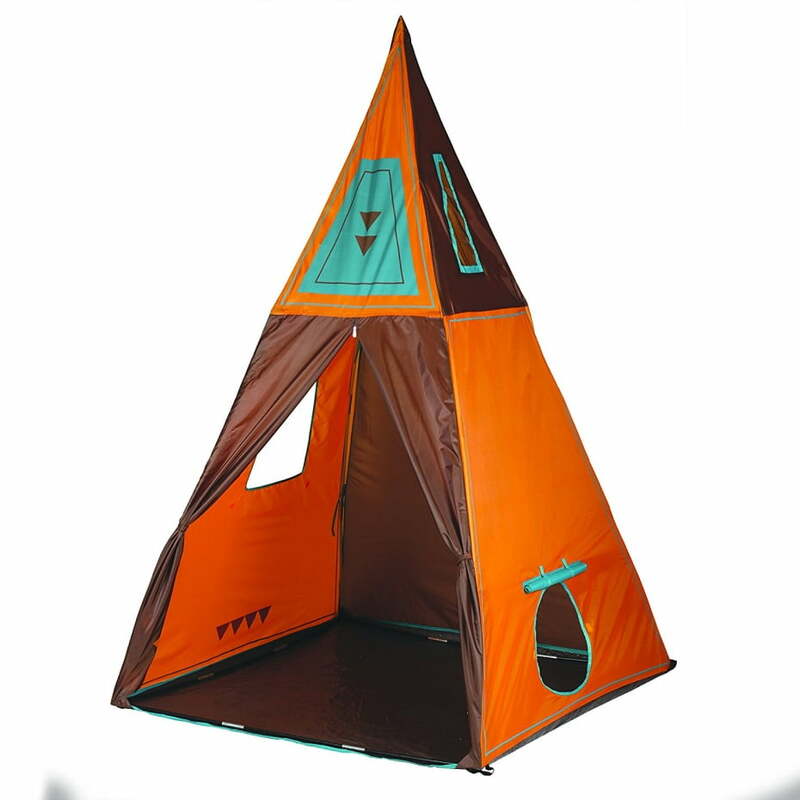 This great teepee can be used inside for a daytime play or outside for a real camping experience! 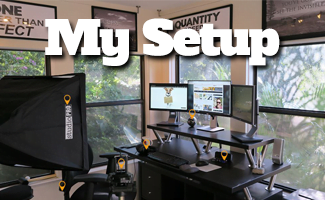 It is easy to set-up and ready for hours of fun! It’s a great place for quiet time, nap time, or play time! Open up a whole new world of possibilities with their very own clubhouse! You can even go for the classic camping trick filled with marshmallows, scary stories, and sleeping in your own tent! Every child deserves a fun desk to use for recreation! This can help children learn patience and give them the ability to sit at a desk for an extended period. This desk comes with five pages of educational material, over one-hundred vocabulary words, twenty activities and twenty songs! Lights will let your child trace letters, numbers, and shapes and break them down into strokes. It has a storage unit and can convert into a chalkboard to open the door to creativity. If you get bored, you can play with the telephone or music player on the desk. You can check your child’s progress with a tracker too! This set is perfect if you want to give your child a head start before school! Doc McStuffins is one of the greatest kid shows of the decade, and this toy is no exception to the franchise’s greatness. 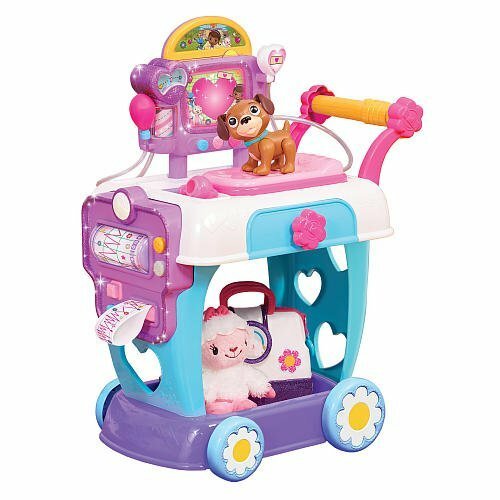 The cute cart features a patient scanner, an ectrocardiogram tester, a blood pressure tester, a drawer, Findo, Lambie, and a medical bag! This cart can roll around and is the perfect size for kids ages three to six. It also plays “Welcome to the Hospital” that has kids singing and dancing along as they stroll through the house taking care of their animals. They will learn many valuable things about not just caring for animals, but medical knowledge in general. Under normal circumstances, trampolines are not safe for toddlers due to their height, flexibility, and ability to flip them high into the air. But with Little Tikes, the toy has just enough give to be perfectly sound. The bar gives extra stability, and the soft exterior makes it great for climbing up onto. This is wonderful for kids needing to burn excess energy, and helps develop coordination, balance, and fitness intelligence. 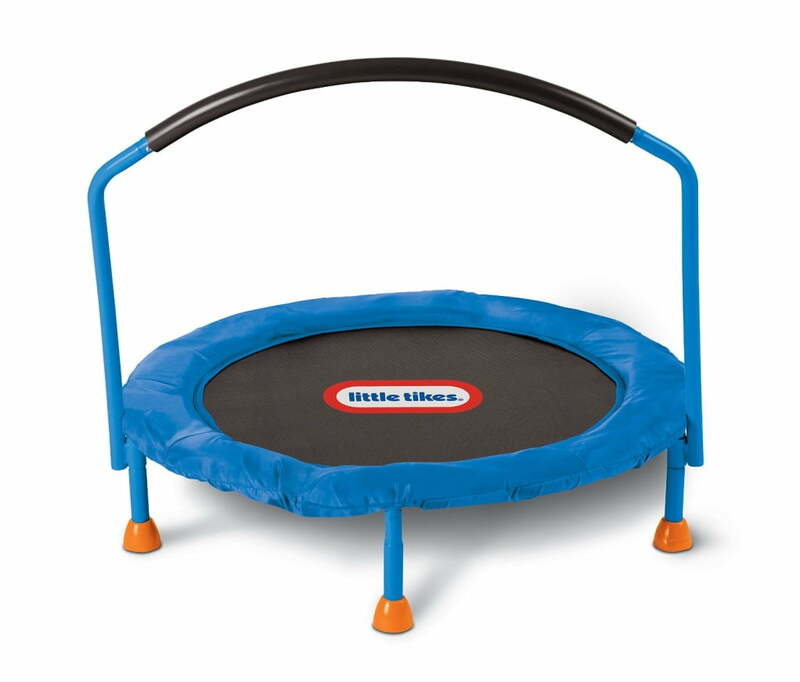 Kids will bounce all day on this thing for hours of exercise and entertainment! The bar is also makes a great naptime bed, mat, table, tent, or monkey bar for your little monkeys! This category is made up of the most expensive toys for toddlers. You may be surprised that is as far as we go. But high-priced toys are not that common for little ones. 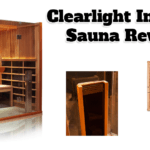 This is the one place you can save without having to cutback. 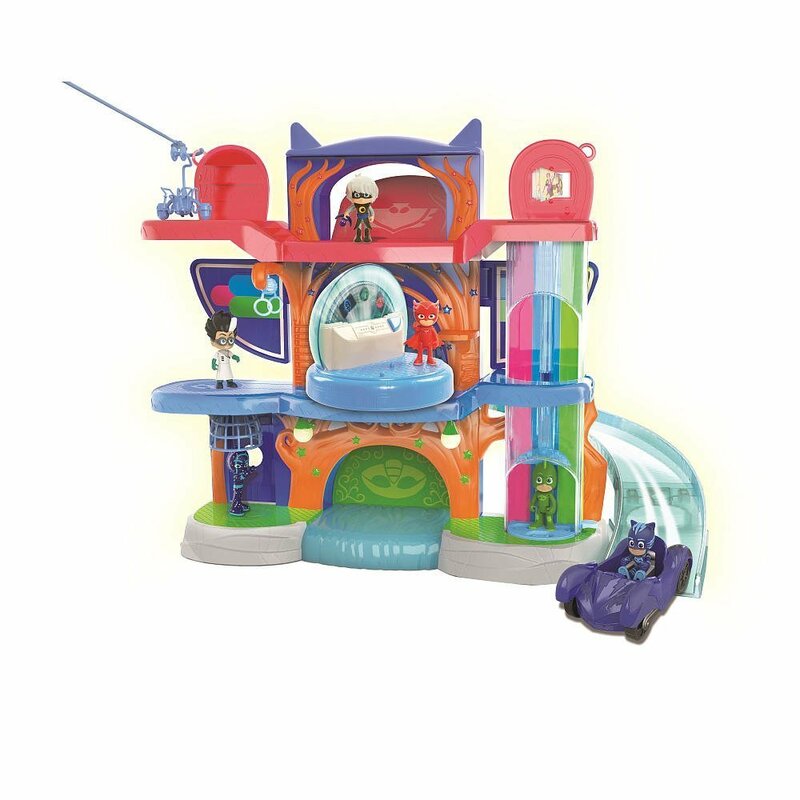 PJ Masks is big, and any fan of the show would be much more than pleased to receive this play set. It is jam-packed with tons of adventure! Don your pajamas and go on missions with your favorite characters. The picture player will play the theme and other fun phrases. Cat Boy will zoom around in his Cat Car or whirl down the ramp! You can use the zip line, elevator, hanging rings, and hatches to navigate you way around the massive HQ! Little minds will love to recreate their favorite moments from PJ Masks or create new ones on their own using the cognitive skills! This set is reserved for kids older than two, but will last them for a few years after that! Every kid needs a set of table and chairs to color at, play at, set up blocks and toys at, and of course eat at! This colorful set is perfect for a bedroom or dining and its neutral design will probably match your other furniture! 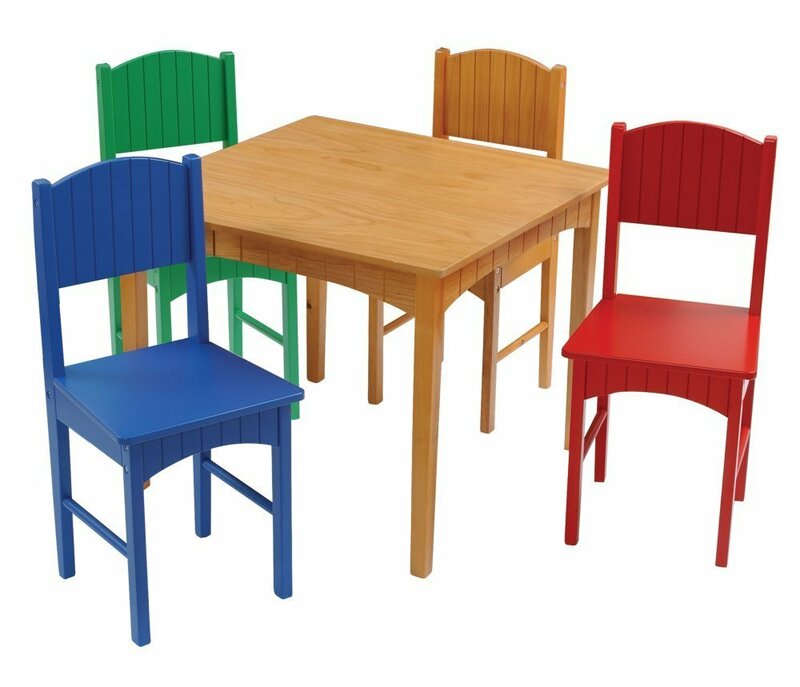 It has four chairs so your kid can invite his friends or siblings over for a tea party, coloring get together, or a simple dinner! The table is durable, non-toxic, and is beautiful for any corner in any room! These may just be the hottest toys of the season! Every kid is asking for one. This toy is very interactive! You must encourage this guy to hatch, and just like a real egg, you don’t know exactly what you will get. After you tip and tap and keep your egg warm, the glowing eyes will let you know they are ready! Hatch! The fun still isn’t over though…you must raise these little guys and teach them how to walk, talk, and dance! 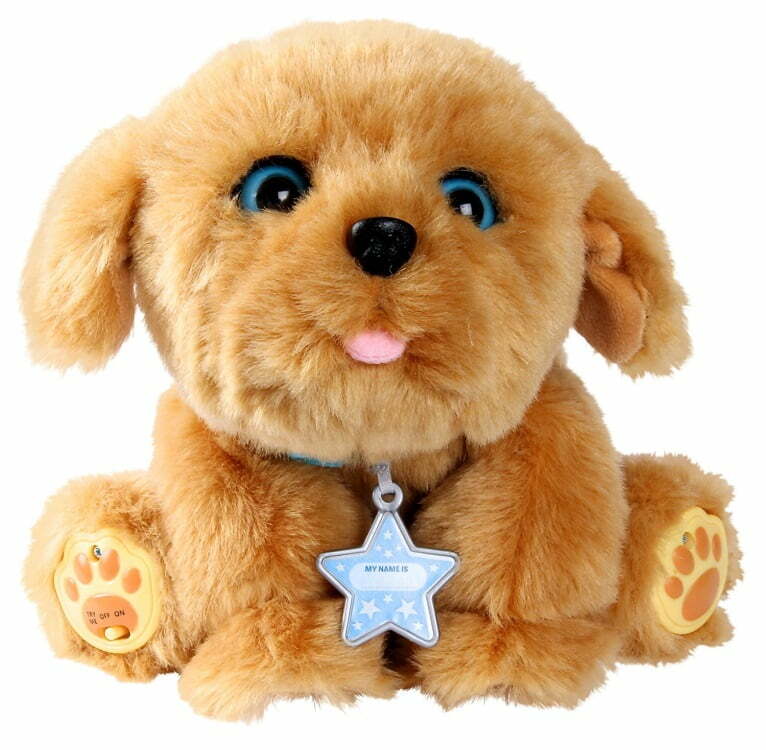 This toy is recommended for big kids, but older toddlers will absolutely love these adorable little pets! There are lots of different animals in various colors that can hatch from these eggs…let’s see what yours will be! 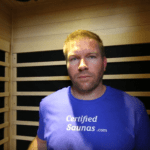 The benefits of this workshop are endless. 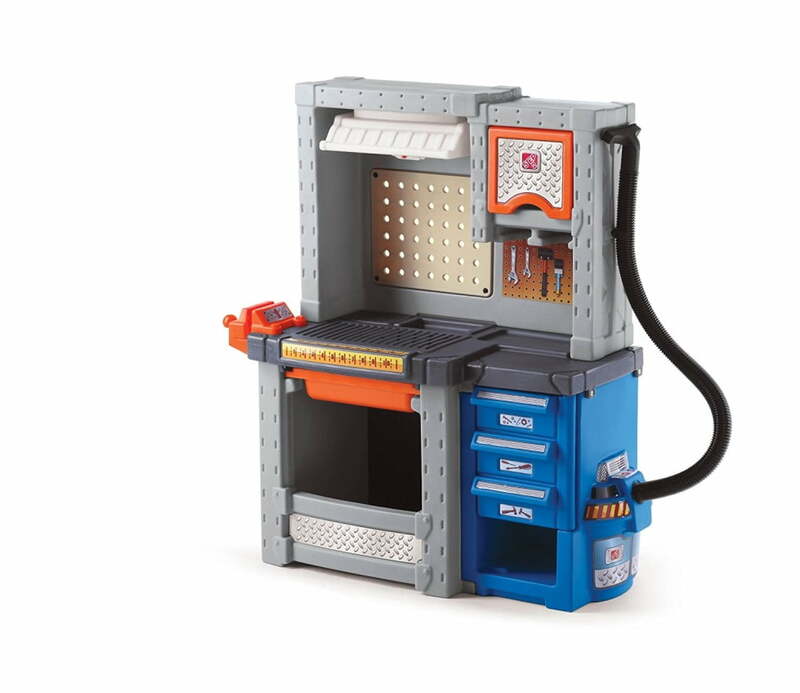 It comes with fifty accessories for your child to experiment with, including an electric drill, two bits, eight screws, eight nuts, a saw, hammer, a pair of pliers, an adjustable wrench, a screw driver and seventeen pieces of plastic wood that is relatively realistic! Your child can learn how to use these tools in a safe way and keep themselves organized with doors, pegs, and shelves. You can even “clean-up” with an attached shop vac! There are four projects, including a birdhouse, with instructions that give you a place to start before branching out on your own. This magic kitchen from Little Tikes responds to your child by teaching them the names and uses of over forty different foods and utensils. Cook food in the oven and watch dishes in the sink! Sound effects include knife chopping, egg sizzling, and water pouring. You can even Bluetooth it to your phone or tablet for extra games and activities! 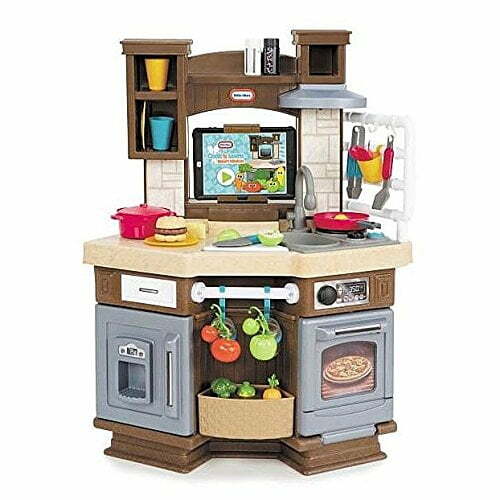 All of your little ones will love to be just like mommy or daddy with this life-like kitchen. 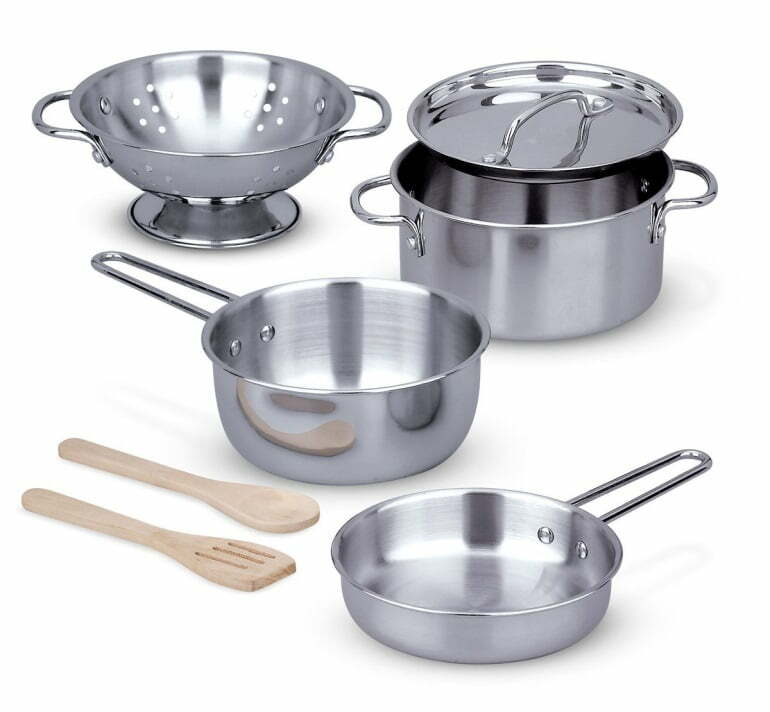 This set is great for learning how to use a kitchen and teaches kitchen etiquette, health benefits, valuable safety information and organization skills! Choo! Choo! 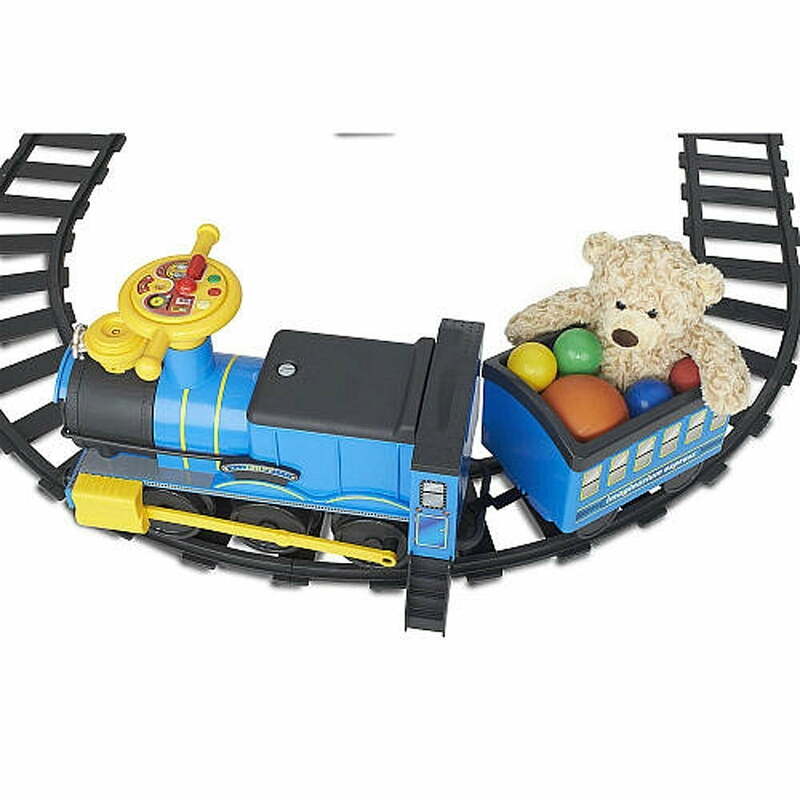 Chugga chugga your way around the twenty-three foot track in this fun trainset that really goes! It can go forward or backward, makes train sounds, and emit “smoke”! The caboose is great for hauling toys and small passengers! Little ones will sit on the steam engine for hours with a smile on their face! For every kid that wants a riding toy, here is one that requires less interaction from you, letting you sit back and watch your child enjoy the fun on their own! All aboard stuffed animals and recent attachments for a trip around the world! The Step2 kitchens are great for two year olds, four year olds, or even bigger kids! They will spend hours living in their own “grown-up” world. This realistic set includes over one-hundred accessories, and an electronic grill, stove top, and phone all make life-like noises! The large sink with faucet, microwave, and refrigerator are up for loads of fun and role-playing. Your child can take turns cooking for friends that will wait at the dining area which is included. The storage spaces will fit all of the utensils and food. Check out the other Step2 kitchens for more fun in different levels! Playing with toys is very important for your child to grow up healthy. You must be sure to cover all grounds. Toys for physical and muscle development will include bikes, puzzles, and kitchen/workshop sets. Toys for sensory will include instruments, play-dough, and scented toys. Toys for social development will include dolls, role-playing, cars, and books. Toys for creative development will include crayons, books, blocks, and role-playing. Babies are born knowing literally nothing, and it’s up to you to expose them at the right times to each theme everything they need to not only survive, but thrive. They don’t know what heat is, that they can fall down, or that there’s a whole world out there. 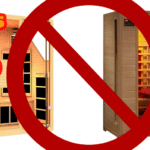 They will continuously experiment so it’s important that you make the right experimental products available to them. It’s also imperative that the child can play on his own and with others. So if they don’t have friends to play with, join them every once in a while, but not every time. Make sure you cover every development category with their toys and talk to them about what they are playing with. Let them tell you what they have and how to use it. What colors their toys are, how many they have, what shape it is, and which animals are at their farm. Don’t forget to be the teacher and the student. Remember to teach them the importance of caring for animals and dolls, and they will soon be telling you why they need to feed them or how gentle you must be. As a whole, with a gentle push and the right exposure, a child will develop on its own. 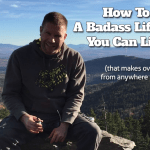 But as a caregiver, you have the power to control at what rat they mature, develop, and grow.